When you take battle damage from an opponent’s attacking monster: You can Special Summon this card from your hand, then you can Special Summon 1 monster from your hand with ATK less than or equal to the damage you took. I’m not sure what I’m looking at…but apparently it’s Parry Knights. Parody on Party Nights, this monster isn’t bad at all. While six star, 2300ATK monsters aren’t popular, Parry Knights may be a better monster than Gorz. Any battle damage your opponent inflicts on you allows you to Special Summon this monster. No restrictions to having a clean field like with Gorz, and you get a monster instead of a token with Parry Knights. Double Special Summon on your opponents turn (baring you have a monster equal or lower the damage you took), that is a major upside. Monster that is equal or lower the damage you took can kick its effect(s) upon summon and gain you a plus on your opponents turn, which will divert their plan and cause them to use resources against your new monsters. Gorz has higher ATK and the token it drops is higher too. Parry Knights is an interesting card that could see some play in the right deck. In some cases it could set up an Xyz Summon or more likely a Link Summon. I’m curious to see where it would fit best. It’s Type and Attribute don’t really matter considering its Level and ATK. Parry Knights is a Level 6 Earth Warrior-type monster with 2300 Atk and 2100 Def. Mini Gorz over here should be considered for actual play about as often as Gorz. You have to take the Battle Damage before you can Special Summon Parry Knights from your hand. Then you can also summon a different monster from your hand with Atk less than the Battle Damage you just took. Two monsters out of the hand sounds good, but this is during your opponent’s turn. They would have to let you keep those monsters before you could do anything good with them. You might not have a weak enough monster to satiny the conditions. Gorz at least gives you a token which saves hand resources. 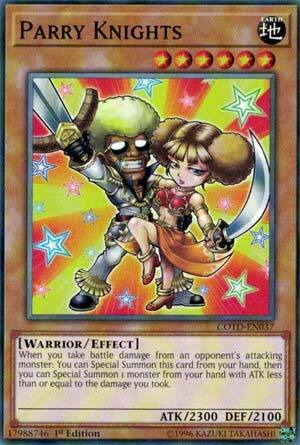 Although I suppose actual monsters might be better for Link Summoning better Link Monsters. There is no once per turn on this, so multiples could work. You can summon another Parry Knights if you take 2300 or more damage. But if you’re taking that much damage off one attack, this card won’t be enough to save you. Crunch$G We end this week of Code of the Duelist cards off with one of the Short Print commons in the set, Parry Knights. Parry Knights can be Special Summoned from your hand when you take battle damage from your opponent attacking, and if you do summon it this way, you can Special Summon a monster from your hand with ATK less than or equal to the damage you took. This is a pretty cool Short Print common, but it is more effective if you take a decent amount of damage, otherwise you are likely summoning something weak, assuming you are able to summon anything off this effect. This does help you with a Link Summon or maybe go into a Rank 6 play if you have a Level 6 with low enough attack. Another card this week with some potential, but not too much to be honest. It likely for this to see play in Duel Links if it is ever put into that game (I love Duel Links), but I don’t really know how likely it is for this card to see play in real life. It has potential like I said, but it is a very small amount of potential.